We’re in the middle of an observing run at the Lick 3m Shane telescope, with the first part devoted to polarization measurements of the Voorwerpje clouds (which is to say, giant clouds of ionized gas around active galactic nuclei found in the Galaxy Zoo serendipitous and targeted searches), and just now switching to measure spectra to examine a few new candidate Voorwerpjes, and further AGN/companion systems that may shed light on similar issues of how long AGN episodes last. Polarization measurements can be pretty abstruse, but can also provide unique information. In particular, when light is scattered, its spectra lines are preserved with high fidelity, but light whose direction of polarization (direction of oscillation of its electric field when considered as a wave) is perpendicular to the angle it makes during this operation is more likely to reach us instead of being absorbed. This is why polarized sunglasses are so useful – glare from such scattering light can be reduced by appropriate orientation of the polarizing filter. 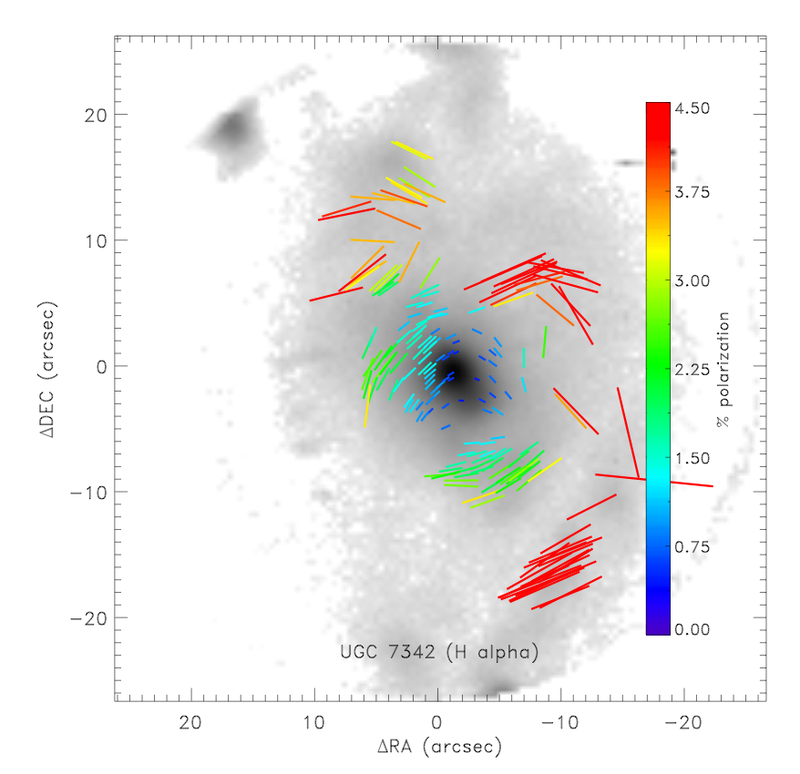 In our context, polarization measurements tell us something about how much of the light we see is secondhand emission from the AGN rather than produced on the spot in the clouds (admittedly as a side effect of the intense UV radiation from the nucleus), and will show us whether we’re fortunate enough that there might be a dust cloud reflecting so much light that we could look there to measure the spectrum of the nucleus when it was a full-fledged quasar. (This trick has worked for supernovae in our galaxy, which is how we know just what kind of supernova was seen in 1572 despite not having spectrographs yet). Polarization wizard Sebastian Hoenig (now at the Dark Cosmology Center in Copenhagen) has already produced preliminary calibrations and maps from these new data. Here are some visualizations. In each case, the lines show the direction of polarization. Their length and color show the fraction of light which is polarized at points where there is enough to measure. This fractional polarization tells about the mix of light arising on the spot (even if secondhand due to UV radiation ionizing the gas) and that reflected from dust particles. There is a telltale annular or bull’s-eye pattern when the scattered light originates in a central source, which we see over and over (as if we hadn’t figured out to blame the galaxy nuclei anyway). First up is a personal favorite, UGC 7342 (the last one to have its Hubble images obtained, and among the largest and brightest of the Galaxy Zoo sample). 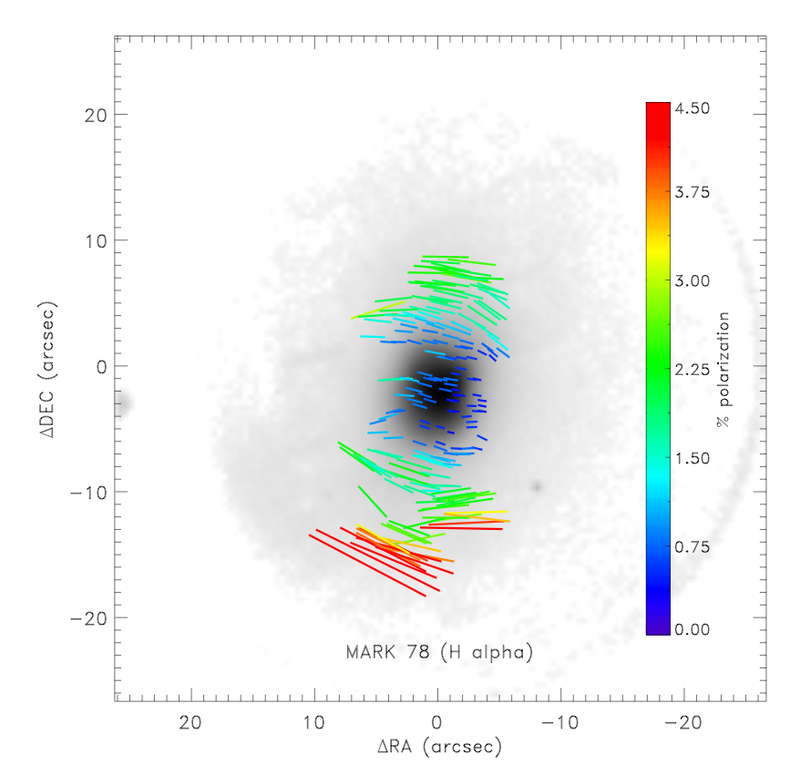 The next one, Markarian 78, is less familiar, oddly because it makes perfect sense (so it has not figured much in the followup observations). In this case, we see a bright and obvious active nucleus, one which is powerful enough to light up the giant gas clouds without having changed over the past 60,000 years or so. For comparison, here is a polarization map of IC 2497 and Hanny’s Voorwerp itself, from data obtained last year (the first time the weather let us get useful results). Sometimes we can hear the Universe laughing – a quick simulation shows that the reflected light from the nucleus, when it was a quasar, is just a bit too faint for us to have seen its signature broad emission lines in any of the Voorwerp spectra. As we switch into measuring spectra for the next few nights, the aim changes to a combination of looking at a few new Voorwerpje candidates from the Galaxy Zoo forom, and a set of newly-identified AGN/galaxy pairs which may let us study the same issues of AGN lifetimes. We can sort of settle into a routine – Anna Pancoast does calibrations and setup during the day and hands over to Vardha Bennert to finish observations during the night. I typically get to work before Vardha finishes the last galaxy observation (thanks to the time-zone difference) and transfer data to start analysis, so we can change the next night’s priorities if something interesting shows up. It takes a (global) vllage, but then if there’s been any single meta-lesson from Galaxy Zoo, that would be it. Is it just me, or is the center of the UGC 7342 polarization bullseye offset from the nucleus (slightly to the south)? Studying AGN/galaxy pairs sounds quite exciting (well, having the results to study; actually obtaining the data … perhaps not so much). Many a fascinating GZ blog entry – and paper – to look forward to. 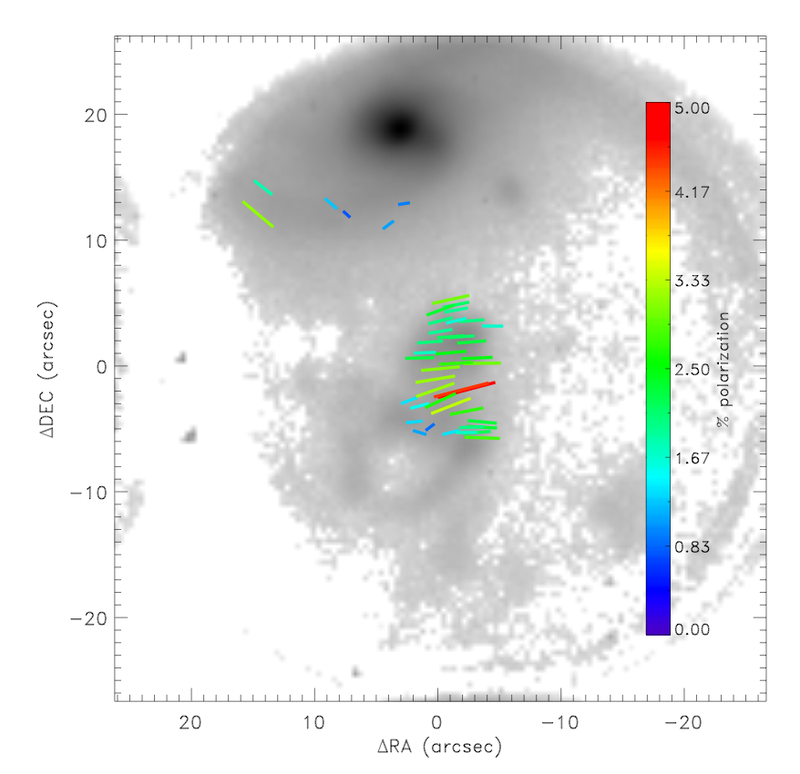 The AGN/companion pairs are taken from the forum thread, collecting emission-line data where available and using that to pull out the most likely candidates for cross-ionization (since we can only do a few per night with enough signal to look for the emission-line ratios far from the AGN). 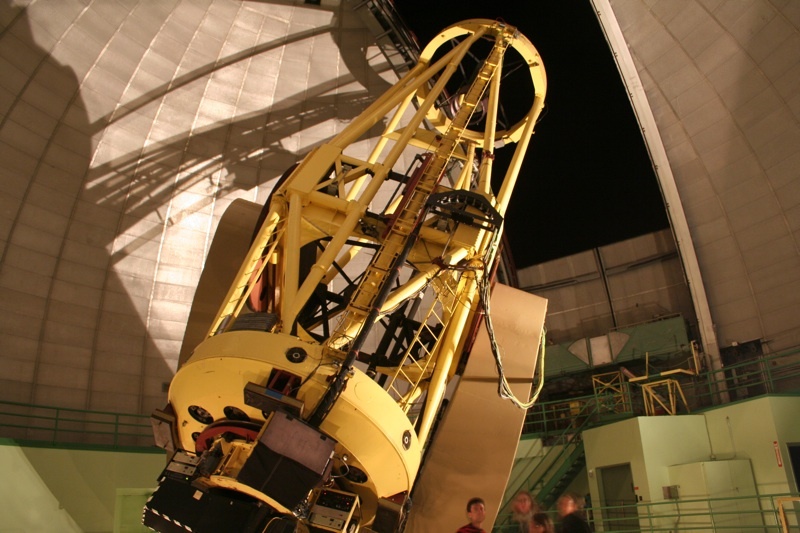 Not that this is doing us much good at the moment, with the stars visible but humidity too high to open the dome… Previous data gave us a few good candidates, and this session lets us catch up with objects posted up to now.